The C compact granulators are designed with a completely soundproof enclosure resulting in an extremely quiet operation. Different rotor designs are available in widths ranging from 300 mm to 1400 mm. The completely welded cutting chamber in conjunction with the “V” type rotor design ensures dependability in operation and universal application use. While it delivers excellent sound proofing capabilities, it still offers easy and quick access to the cutting chamber during rotor and stator knife changes, servicing or screen changes. 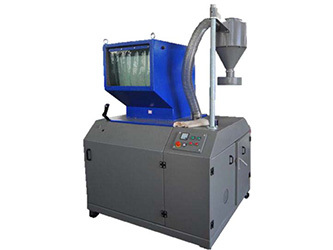 The sound dampening material used in these machines is based on the latest technological research. The cutting geometry of the C series allows even voluminous materials to be ground. The complete series achieves a high-quality regrind independent of the material type or form such as biomass from wood, grasses, coconuts and other vegetation, etc. The C 30 series machines have a small footprint and easy movability make the machines very easy to place in existing operations. The C 50 series machines are mainly used in inline operations or small central granulators for processing of medium sized hollow thin walled pieces or waste materials. The C 70 series machines are mainly used as central granulators for processing of large pieces or waste. The integrated soundproofing on both series makes it possible to easily place the machine in existing operations. With different rotor designs and a wide variety of options the machines can be tailored for many different applications. The C granulators are available with different rotor options to fit different applications, all rotors feature the V-cut technology creating a high quality regrind. To minimize the needed floor space and make the machine easy to move, machine controls and electrical cabinet are integrated into the machines soundproof housing. To minimize the needed floor space and make the machine easy to move the control cabinet, motor and hydraulic opening system are integrated into the machine’s soundproof housing. The user-friendly design of the C series granulators allows quick and easy access to the cutting chamber for maintenance and cleaning. To ensure a safe operation and quick and easy access for cleaning and maintenance the C 50 machines cutting chamber is opened hydraulically.